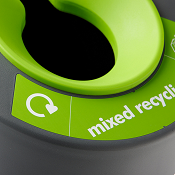 Not only is Stream recycling bin 100% recycled plastic, but it's also made from recycled UK post-consumer plastic. An unprecedented environmental credential. 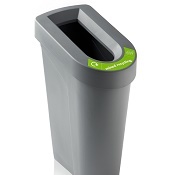 The Stream Bin is just as elegant without the coloured insert, offering you more budget flexibility. The insert can be easily changed, so if your bin changes role at a later date, no problem. - Nice 'n' tall, no bending down required - Large overhanging lid, no ugly liners visible - Air hole, for easy bag removal - Angled top, faces user and improves visibility. 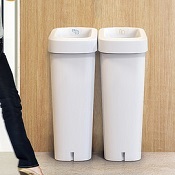 - 70 Litre capacity - Width 33cm x Depth 50cm x Height 81cm Just see below some suggestions of how you can use this bin As this range of bins has many variations for further information please contact our team and we will be pleased to discuss your office recycling bin project further.